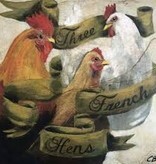 Cody's three french hens is a sweet holiday gift from the "12 Days of Christmas" song. French hens were a prized table bird in both France and England. The breed Bresse Gauloise was sometimes called the "queen of poultry and the poultry of kings". This breed originated in France in the late 16th century. La Fleche is also an ancient French breed from the Loire region of western France, and was renowned for its delicate flesh. During the 16th century hens from France were a luxury import from France.